you with his TRANQUILLISER gun. The word in French for reassure is the regular ER verb tranquilliser. It also means to soothe or calm. To remember this, imagine a hunter REASSURES you with his TRANQUILLISER gun. Be reassured that Cartoon Memory Triggers can soothe you into effective French language learning. Be reassured that with them you will better remember a word...just think of the pic! reassure! tranquillise ! tranquillisons ! tranquillisez ! ⇒Tranquilliser is a regular ER verb conjugated in like 5000 others. These are the most common verbs in French. ⇒Learn tranquilliser and it will reinforce the pattern for ALL those other ER verbs. ⇒ You can more easily remember words and verbs like the French verb tranquilliser - French for reassure = using the techniques of the world's Memory Masters. 200 Words a Day! Free Daily French Lesson Online - the French verb tranquilliser - fully conjugated. 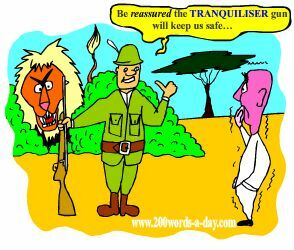 French Learning Made Fun and Fast with your free Daily French Verb Lesson - tranquilliser.